NSAIDs inhibit the normal enzymatic action of the cyclooxygenase (COX) molecule. COX catalyzes the conversion of membrane fatty acids (principally arachidonic acid) to prostanoids and thromboxane. Arachadonic acid is a ubiquitous membrane fatty acid released in response to injury or cell-to-cell signaling (see panel). Prostanoids have a short half life. They are used within the cells that produce them or are exported from the cell affecting cells close to the site of production. COX-1 is normally present in most tissues and produces prostanoids that contribute to tissue homeostasis, cytoprotection and cell-to-cell communication. Importantly, platelets contain only COX-1 which is irreversibly inactivate by aspirin. Platelets lack the mechanism to produce additional COX-1, therefore aspirin permanently stops the synthesis of thromboxane and thus inhibits aggregation of the exposed platelets. Non-selective forms of NSAIDs block the action of both the COX-1 and COX-2 enzymes throughout the body. Unfortunately, inhibiting the COX-1 enzyme can produce potential life threatening complications, particularly in the gastrointestinal tract. In the GI tract, COX-1 produces PGI2 and PGE2 that reduce acid secretion, increase blood flow and stimulate the secretion of mucus in the esophagus, stomach, and intestine. When this protection is compromised, the patient is at increased risk for potentially life threatening gastrointestinal erosion, perforation and hemorrhage. To reduce this risk, "selective" NSAIDs or "COX-2 inhibitors", were developed and marketed. They were targeted for long term NSAID use and/or for patients who are at risk of NSAID induced gastrointestinal or bleeding problems. NSAIDs that selectively inhibit the COX-2 enzyme include celecoxib (Celebrex), rofecoxib (Vioxx), and valdecoxib (Bextra). the lack of any demonstrated advantages for Bextra compared with other NSAIDs. Pfizer has agreed to suspend sales and marketing of Bextra in the U.S. pending further discussions with the agency. Revise the Celebrex label to include a boxed warning containing the class NSAID warnings and contraindication about CV and GI risk, plus specific information on the controlled clinical trial data that demonstrate an increased risk of adverse CV events for celecoxib. Encourage practitioners to use the lowest effective dose for the shortest duration consistent with individual patient treatment goals. Include a Medication Guide as part of the labeling. It will be required to be given at the time the drug is dispensed to inform patients of the potential for CV and GI risk associated with NSAIDS, in general, and Celebrex specifically. The Medication Guide will inform patients of the need to discuss with their doctor the risks and benefits of using NSAIDs and the importance of using the lowest effective dose for the shortest duration possible. Commit to conduct a long-term study of the safety of Celebrex compared to naproxen and other appropriate drugs. Vioxx (rofecoxib tablets and suspension): Vioxx was voluntarily removed from the market by Merck in September 2004. FDA will carefully review any proposal from Merck for resumption of marketing of Vioxx, and would likely discuss the review with the new FDA Drug Safety Oversight Board and an Advisory Committee before making a final decision. Selective NSAIDS block the action of the COX-2 enzyme. NSAID analgesics are used for a wide variety of painful nociceptive and neuropathic conditions of mild to moderate intensity. NSAIDS are frequently used to help relieve muscle and joint pain. If a patient is experiencing mild pain, he or she may be given an NSAID analgesic alone. For moderate to severe pain, an NSAID analgesic may be combined with an opioid analgesic as part of a comprehensive analgesic plan. Combining an opioid analgesic and a nonopioid analgesic may provide more effective pain relief than either one alone; such drug combination may inhibit both the transduction and the transmission of pain signals to the brain. Whenever pain is severe enough to require an opioid analgesic, adding a nonopioid analgesic should be considered, is a basic principle of analgesic therapy. NSAIDs are often combined with an opioid analgesic due to their "opioid dose-sparing" effect. Opioid dose sparing refers to the fact that when a nonopioid is combined with an opioid, the opioid dose can be lowered without compromising pain relief. A lower opioid dose decreases opioid related side effects. NSAIDs are frequently used alone to treat severe pain. tablet for oral administration, combines the opioid analgesic agent, oxycodone HC (5 mg), with the NSAID agent, ibuprofen (400 mg). Serious CV and GI side effects have been associated with the use of both selective and nonselective COX 1&2 inhibitors. use with caution in elderly or debilitated patients, and those with severe impairment of hepatic, pulmonary or renal function, hypothyroidism, Addison's disease, acute alcoholism, convulsive disorders, CNS depression or coma, delirium tremens, kyphoscoliosis associated with respiratory depression, toxic psychosis, prostatic hypertrophy or urethral stricture. tablet for oral administration, combines the opioid analgesic agent, oxycodone HC (4.8355 mg), with the aspirin (325 mg). indicated for the short-term (generally less than 10 days) management of acute pain. The most common side effect of opioid analgesics is constipation, as compared to NSAIDs, which can cause gastric ulcers, bleeding and perforation, increase bleeding time, and result in renal insufficiency. The nonopioid acetaminophen can cause serious hepatotoxicity. Gastrointestinal side effects associated with NSAID use can be both local and systemic. Local effects occur due to local irritation from an NSAID taken by mouth. Symptoms may include heartburn and upper abdominal pain. These symptoms often occur early in therapy. Local symptoms may be resolved by lowering the dose, changing to another NSAID, taking an enteric form of an NSAID and by taking each NSAID dose with food or a large glass of water. Systemic effects can be extremely serious. Regardless of the route of administration, NSAIDs interfere with prostaglandin synthesis throughout the entire body. 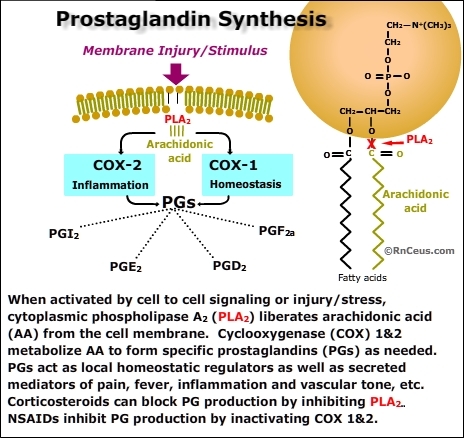 Maintenance of the protective barrier in the gastrointestinal tract depends on normal prostaglandin synthesis. When this barrier is disrupted the patient is at risk of adverse events such as perforation and hemorrhage of the esophagus, stomach, and the small or large intestine. Enteric-coated NSAIDs, food, or antacids do not protect the patient from the risk of systemic side effects. These potentially life-threatening side effects can occur at any time during therapy, most often without any warning signs. To minimize the risk of gastrointestinal complications, NSAIDs should be used at the lowest effective dose for the shortest time they are needed. In addition, alcohol use while taking NSAIDs should be restricted. Patients taking NSAIDs should be advised to eat regularly and to avoid fasting because fasting can increase toxicity. Nonselective NSAIDs are inexpensive and usually appropriate for short term or intermittent use. For patients who use NSAIDs on a regular basis, the more expensive but safer selective NSAIDs may be more appropriate. Patients who are at high risk of adverse gastrointestinal complications may be given drugs such as misoprostal (Cytotec), that help protect the gastrointestinal tract from the effects of NSAIDs. NSAIDs can also cause liver damage, which is usually detected by an increase in liver enzymes. Both nonselective and selective NSAIDs can cause renal insufficiency. Therefore, patients who take NSAIDs should be monitored carefully for renal impairment. Signs of renal insufficiency may include the sudden development of oliguria with sodium and water retention. NSAIDs can also cause some central nervous system (CNS) side effects, such as a decreased attention span or loss of short-term memory. Because nonselective NSAIDs interfere with normal bleeding time, they should be discontinued several days to one week before any surgical procedure. Cox-2 NSAIDs do not decrease platelet aggregation. As a result, Celebrex may be used perioperatively and in other clinical situations in which bleeding is a concern. Fasting increases the risk of NSAID toxicity. Dont take an NSAID with alcohol. Dont take more than one type of NSAID, with the exception of a small daily dose of aspirin for heart attack prevention. Take NSAIDs with a full glass of water or milk, with meals, or with a prescribed antacid. Remain upright 30 minutes after administration to reduce gastric irritation or ulcer formation. Unless contraindicated, drink 2-3 L of water a day. Report any changes in stool consistency or symptoms of gastrointestinal irritation, any bleeding episodes, ringing in the ears, skin rashes, sudden weight gain and decreased urine output, fever or increased joint pain. Use caution when operating machinery or when driving a car, as NSAIDs may cause dizziness or drowsiness. If the individual is a diabetic, he or she should be aware of interactions between specific NSAIDs and hypoglycemic agents. Notify all healthcare providers of all medications taken. Keep all medications, both prescription and over-the-counter, in a safe place out of the reach of children. Patients should be encouraged to combine NSAIDs for optimum pain relief.